Animals understand so much more than we give them credit for. Those natural instincts to love and care are always there, and the moments where animals are able to show us those are truly remarkable. 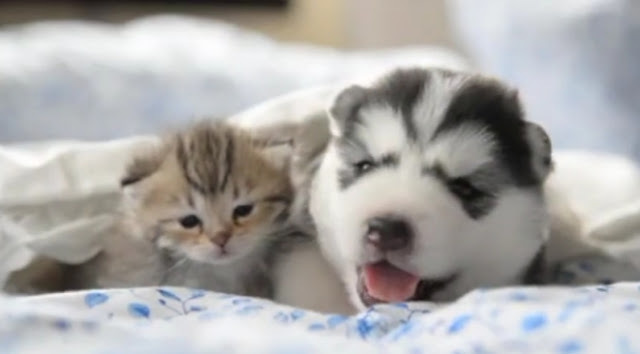 Compilation video that shows all the best cat and dog friendships. Toss the stereotypes out the window and enjoy. Conflicts arise between cats and dogs because they see the world differently. "The cat tries to get away, the dog thinks the cat is inviting it to a game, and so chase ensues with neither party understanding what the motivation of the other one is," says anthrozoologist John Bradshaw. When they do get along, however, it's adorable! There are many different ways to introduce a dog to a cat. If the first method of introduction you try doesn’t work or you don’t feel comfortable with it, try a different option. Even if the dog has had experience with cats and the cat has lived with a dog before, proceed cautiously during the introduction. It’s best to have two people present — one to intervene with each animal, if necessary. If you have more than one dog, introduce each dog separately to the cat. Responses to "These Cat And Dog Best Friends Shatter Stereotypes And Melt Hearts"